"From that moment on I knew that I hated him. I hated Niklaus for what he did and I would do anything in my power to make him pay." 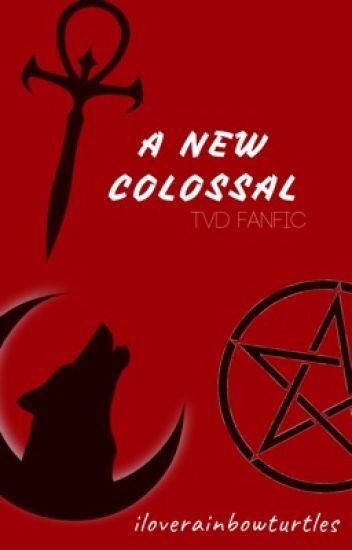 In a world where the supernatural exist there are werewolves, vampires, witches, dopplegängers,and even hybrids. But what many people don't know is that there is also a tribrid, or like she's called, a Colossal. She's a werewolf, a vampire, and a witch. But she's not what everyone would expect. The Mikaelsons were not the original vampires. My name is maria Alexander and i am 2000 years old. My mother was a human and my father, a very powerful witch. Although, he didn't know my mother was a werewolf. "I'm older than you mikaelson" i smirked. "oh, it's quite the opposite" i chuckled. Natalie Mikaelson is the Daughter of Katherine Pierce and Elijah Mikaelson. She's a Human/Vampire Hybrid and stopped growing at the age of 18. She loves to party around and enjoy herself so she comes to Mystic Falls. Natalie meets the energetic and attractive Damon Salvatore. When Stefan learns Damon was planning on taking the cure with Elena, without seeing how he felt about it, he gets into an argument with him and he walks away from him. When he gets home, he gets a call from Klaus asking to meet him in New Orleans because he has a very important favor to ask. So, Stefan decides to go to take a quick break from Mystic Falls. When he gets there, he learns the favor Klaus is asking is to take care of his daughter until the dangers in New Orleans is settled. It takes a little convincing, but Stefan accepts. Will he take great care of Hope? Will he stay in Mystic Falls with Hope? Or will he leave for her safety? If he does leave will he eventually go back to Mystic Falls? If he does, how will the others react when they find out he's been raising their enemies child? "I am literally gonna be your worst nightmare! Get ready...after all I am a Mikaelson!" Mystic Falls was filled with Vampires,Hybrids, Witches,and Werewolves and most importantly the hunters of all these species. But it all had to start with someone...The Original Family! Esther Mikaelson was a witch and her husband Mikael ordered her to turn their 5 children and himself  into Vampires so that they can survive with her witch powers and she did so. But with that package came a secret that she never wanted to get out and that was the fact that Klaus became a Werewolf along with becoming a vampire because Esther had an affair with a Werewolf and he triggered his gene when he killed people to successfully become a vampire. After that,Klaus was then treated like a abomination from Mikael of course and that caused him to not be as close because of the way Mikael treated him. Instead,he became a blood sucking monster that had a child! Kaitlyn Renee Mikaelson was her name! She knew her family as she grew up with them but she left as she got older and she soon realized that she was a Vampire,Witch hybrid and she felt stronger than ever which she was just like her father. Kaitlyn comes back to Mystic Falls to punish Mikael for what he did to her father,to have a little family reunion,and of course to make sure people know her name and are terrified when they hear it! But,along with that comes with revenge,happiness,and a little bit of humanity! "Jeremy move out the way" Matt and Elena yelled. I put both my hands up in mock surrender and waited for him to turn around. " Hello lad don't believe we have met before I just came to town today do you want to introduce me to your friends please" I compelled him.
" He can't be compelled he is taking vervain " Bonnie spoke up trying to throw me into the wall with her powers. " Are you sure about that Jeremy don't you want to introduce me" I said looking into his eyes. " This is Tyler, Matt, Caroline, Bonnie, Elena, Alaric, Damon, Matt, and Stefan" he said pointing to all the people in the room. " How did you do that" Stefan asked. I went and poured myself some bourbon while sitting down. " That's for me to know and for you to dot dot dot" I mocked him smiling.  " What do you want" Tyler asked stepping closer baring his fangs. I just tilted my head and smiled at him. "Ok I see you guys are like Matt here and don't like a joke" I said. " We're not going to ask you again what do you want" Bonnie demanded. " Ok Bonnie what I want is to help you take down Klaus" I stated seriously.
" Why would you want to take down The Original Hybrid"  Damon asked curious. I rolled my eyes " Who wouldn't want to kill him" I asked cocking an eyebrow.  " Good point" Damon said.
" I say we let her help on one condition" Alaric said, " What's that condition" Stefan spoke up. UPDATES EVERY: MONDAY, WEDNESDAY AND FRIDAY! Arabella Christiana Finley was once a wolf, until she copied the first ever vampires ritual and became a hybrid. She is an original but has been separated from them for so long, she misses her family. Her one love that never looked at her twice, Niklaus... While searching for him and the rest of his siblings she is led to The Salvatore's and Mystic Falls. So what happens when she comes face to face with her old life? With all the complications that come with the people in it? DISCLAIMER: Sadly i don't own The Vampire Diaries or it's characters. All rights go to L.J Smith, Julie Plec and Kevin Williamson. Any random names here and there are what i claim to own. The main story-line is also not mine, however any time when the main character goes off on her own then that's all mine and not the shows. Any videos and pictures i use are also things I've found online, if you like any then just type in the links I've provided into your search engine to find some. Adela Forbes is a depressed girl. Her little sister Caroline Forbes was killed by an "animal" but the council and Adela all know that a vampire killed her. Adela became depressed when Caroline died. Her mom told her about vampires, witches, and werewolves. Adela wasn't surprised that supernatural species existed. Her life was awesome until Caroline was killed. Everything was going down hill for her. Her best friends are Elena, Bonnie, Matt, Damon, Stefan, Alaric, Jeremy, and Tyler. Damon and Stefan are vampires. Elena was a doppelganger. Jeremy, Alaric, and Matt were humans. Tyler was a werewolf. Bonnie was a witch. Now there is the most powerful thing in the history coming after Elena. What happens when Adela meets Niklaus Mikaelson. Caroline dies and doesn't become a vampire. Esther doesn't come back. Henrik became a vampire. Freya actually turns into a vampire. Finn isn't suicidal. So if you haven't noticed this is not following the story line in the TV show nor the books. Dea Salvatore the eldest Salvatore sibling. Mistake, unwanted. All her life she protected her brother from the harshness of her father, from the harshness of the vampires. Until her death. Seductress, siren, evil but still a sister, a sister willing to do whatever it takes to ensure her brothers survival even if that means killing his true love or making a deal with the devil. "I watched you die at the hands of Katherine little brother. I won't let it happen again because of some girl wearing her face". "Klaus I'm begging you let him live, I'll do anything you want".